Ok, bloggers, I am back and ready to get started on some awesome challenges for this week. First up is a round sketch challenge for Just Add Ink, http://www.just-add-ink.blogspot.com/ . Head on over and check out the details. I wanted to make this card as a wedding card, cause I had cranberry red, black and very vanilla in mind and new just what I wanted to do. 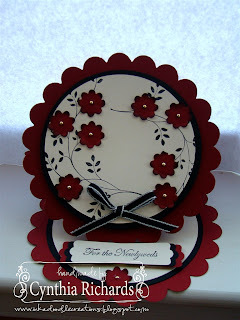 I used the boho blossoms punch and punched out the littlest flower in the red. Centered each with a gold pearl bling (I love bling, it just sounds cool to say, "BLING") I think it must be a womans favorite word next to "Diamond"!! Ok, back to the card, I made a circle easle card and used the label punch as the stopper for the opening. I hope you enjoy my card for this weeks challenge. This is so pretty. Great colors. Love the scallop circles and the label punch. Great choice of colours, Cynthia, and I love all the punched out flowers. The card turned out beautifully! Very pretty, thanks for playing this week at Just Add Ink. This is really beautiful Cynthia! Love the colours, and the flowers, everything! A great card! very striking colours. Thanks for joining us at Jai this week. Love all of the flowers Cynthia and beautiful colour combo.